The GAA club season has become a hot topic of debate in recent years due to the duration of the season, the lack of competitive games, an imbalanced training to games ratio and an increasing number of injuries. Take for example the reigning All-Ireland Football Champions Corofin, who defeated Slaughtneil in the final in March 2015, and began the defence of their title in May 2015 with less than six weeks of a break. 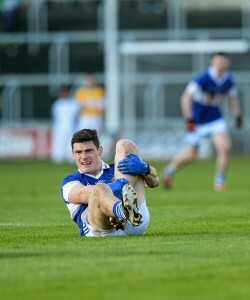 If an inter-county team is successful then the club season can last ten or eleven months, which gives an indication as to why there are so many injuries. A 6-month prospective study of injuries in Gaelic Football from seven senior clubs was conducted by Wilson et al. in 2006. There were nearly twice as many injuries during matches as during training. The ankle was found to be the most commonly injured site (13.3%) followed by the quad and hamstring (both 12.2%). It was found that ankle injuries were five times as common in matches as in training. Muscle and tendon injuries accounted for nearly a third of all injuries (31.1%). Tackling accounted for 27.8% of the injuries sustained and the next most common mechanism of injury was sprinting (14.4%) and turning (13.3%). The fourth quarter of the game had the most injuries (29.3%). Here at The SISM Clinic we have conducted our own 5-month prospective study on a senior club team. 50% of injuries occurred during matches and 50% occurred during training. The lower limb was found to be the most commonly injured site (77.8%) followed by the hamstring (38.9%). Hamstring injuries are averaging 14-21 days out of football. Muscle injuries accounted for nearly two-thirds of all injuries (66.7%). Most common mechanism of injuries was contact (33.3%) and sprinting which accounted for 33.3%. 61% of injuries were new and 11% of injuries were re-injuries. One of the most obvious changes in patterns between the two studies was the shift from contact injuries towards muscular injuries. Hamstring injuries are an epidemic in the GAA at the moment, as discussed in our previous blog, so it wasn’t a surprise to see a surge in muscle injuries. There are a number of factors that contribute to this. Firstly, there has been a huge increase in strength and conditioning in the last few years and these extra gym sessions combined with pitch sessions leaves less time for rest and recovery. Secondly, a vast majority of the workforce in this country have an occupation that requires prolonged periods of sitting. This involves a posterior rotation of the pelvis, shortening of the hip flexors, lengthening of the hamstring muscles, compression of the lumbar discs and inactivity of the glueteal muscles. All of these are risk factors when competing in a field sport that requires sprinting, jumping, twisting and turning. Thirdly, a lot of club players don’t value or spend enough time at their own “maintenance” work. Foam rolling, stretching and mobility work needs to be done on a daily basis if an athlete is (a) sitting for prolonged periods and (b) has an injury history of recurring injuries. No Comments to "Injuries in Club Gaelic Footballers"